Logitech’s Pro line has been delivering great gear ever since the first products in said line came out. Dropping any frivolities or outrageous design choices, the Pro line is aimed at serious competitive gamers who have no use for additional RGB strips or a whole host of extra features. That approach seems to work as well. The G Pro Wireless mouse, for example, took the pro gaming scene by storm and effectively set a new standard for what is possible with a wireless mouse. The G Pro Mechanical Keyboard is a no-nonsense, straight to the point gaming keyboard designed for serious (pro) gamers. Is it worth it, though? Read on to find out. Before connecting it to your PC and before the RGB lights up, the Logitech G Pro Mechanical Keyboard looks like one of the more plain looking boards I’ve reviewed so far. Still good news to me, since I personally prefer a more subdued look for my gaming gear but other people might want the ‘gamer’ aesthetic. The only thing (apart from the RGB, of course) that would give away that this isn’t your regular office keyboard is the fact that the sides of the keyboard are glossy and that the word ‘PRO’ is written in a matte black material (so it’s barely visible if you’re not looking for it) on the right side of the board. I quite like this ‘stealth fighter’ kind of look. The board connects to your PC via a detachable Micro-USB cable. A detachable cable is a must on smaller form-factor keyboards in my opinion, so it’s nice that Logitech thought of that. Despite the completely plastic exterior the G Pro actually feels very robust. I couldn’t manage to make it flex or creak in any way so I’m quite confident that this board can take quite a beating if necessary, which is always good news for people who often take their gear on the road. The included keycaps feel pretty good to me, but the font that they used on the keycaps themselves probably won’t please everyone. This is of no importance to me (I don’t mind the font at all) but if you’re someone who likes to switch out their keycaps every so often you should take note, especially since the Romer-G switches that Logitech uses don’t fit standard keycaps. The RGB, should you care about that, is very nicely done, though perhaps not the brightest. Much like the keyboard itself, the packaging of the G Pro Mechanical is rather no-nonsense. Inside the box you’ll find the board, the cable (which is a pretty stiff but nicely made and braided cable), and some documentation. That’s all there is to it, and I’m good with that. Notable here is that they haven’t gone through a whole lot of trouble to ‘present’ the keyboard in the packaging, meaning that repacking the board is extremely easy. I don’t know if this is a deliberate design decision with the Pro line (I also noticed this with the G Pro Wireless mouse) or if it’s a coincidence, but as someone who likes to put their gear in some sort of container when traveling (as opposed to chucking it in bag ‘naked’) I do appreciate this. We’ve already established that Logitech’s Pro line is built for serious (professional) gamers. Tournament desks and LAN parties aren’t really known for having an abundance of space, so in the interest of minimizing the footprint of the G Pro Keyboard, Logitech has gone for a tenkeyless (TKL) design, meaning that there’s no numpad attached to the keyboard. I don’t mind that, as I think TKL is the best compromise between usability and compactness, but if you need a numpad you might want to look elsewhere, as the G Pro Keyboard is currently only available in a TKL size. 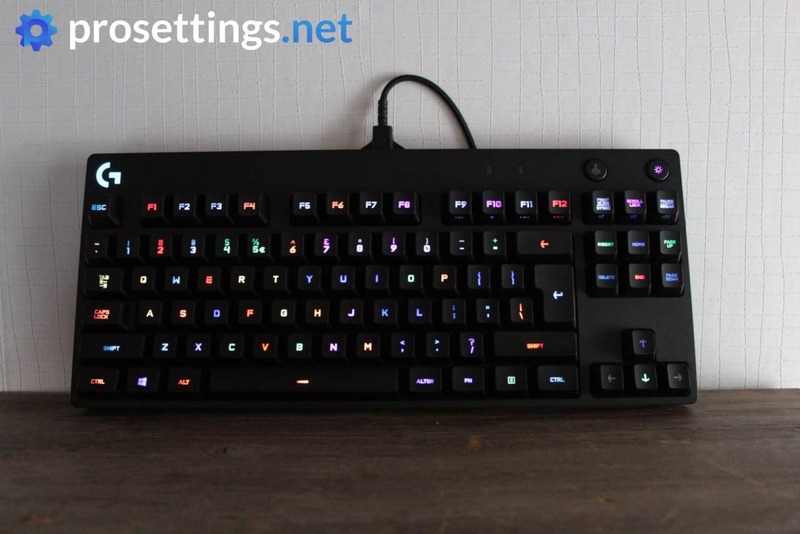 On the board itself you’ll find a button to activate gamer mode (which disables certain annoying buttons such as the Windows key) and a button to toggle the RGB on or off. 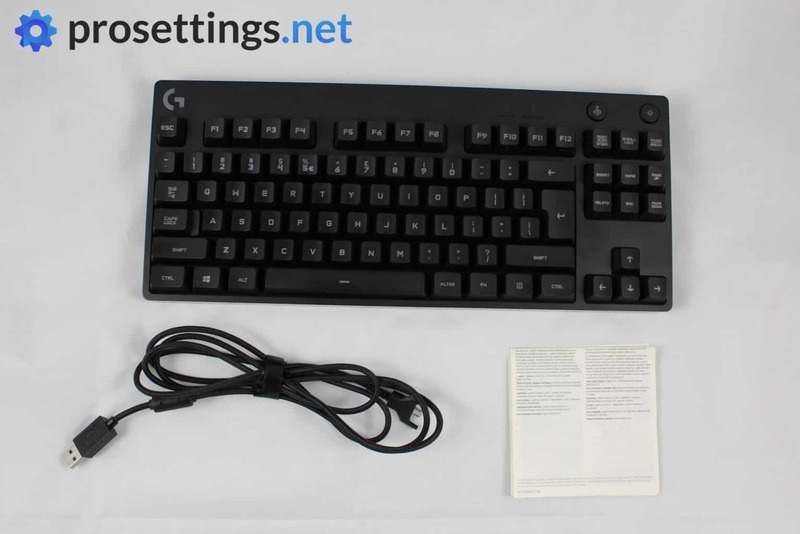 The function keys can be used to do some basic media controlling and you can also assign macros to all of those keys so if you want some extra functionality out of the board you can certainly get that with Logitech’s software. Their software is pretty basic, but it does everything that it needs to do so there are absolutely no complaints from me. On the bottom of the board you’ll find five pretty substantial rubber pads, as well as two keyboard feet to customize the angle that the board’s at. 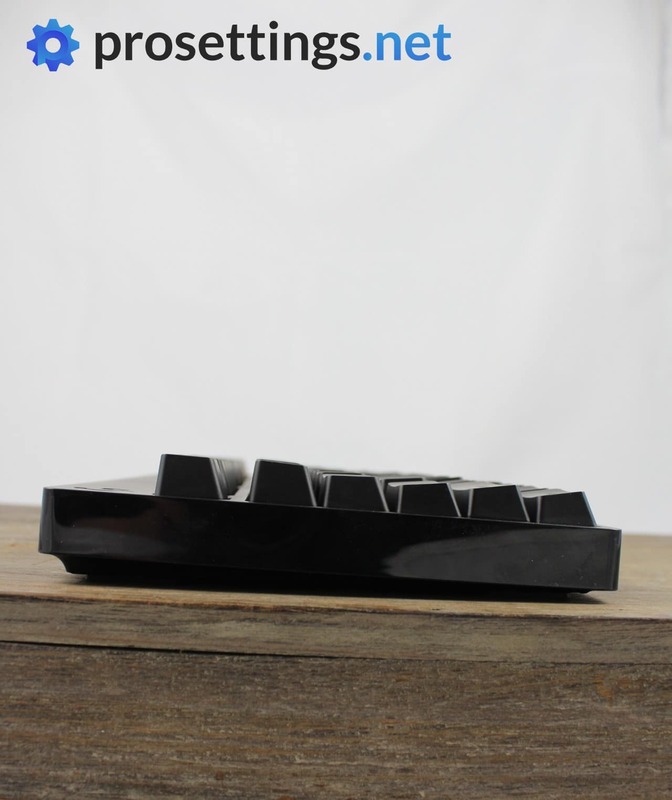 Those feet also have a rubberized element on the bottom so you’ll absolutely never have any issues with the keyboard slipping away under any circumstances. All in all though there really isn’t all that much to say about the features and build quality of this keyboard. 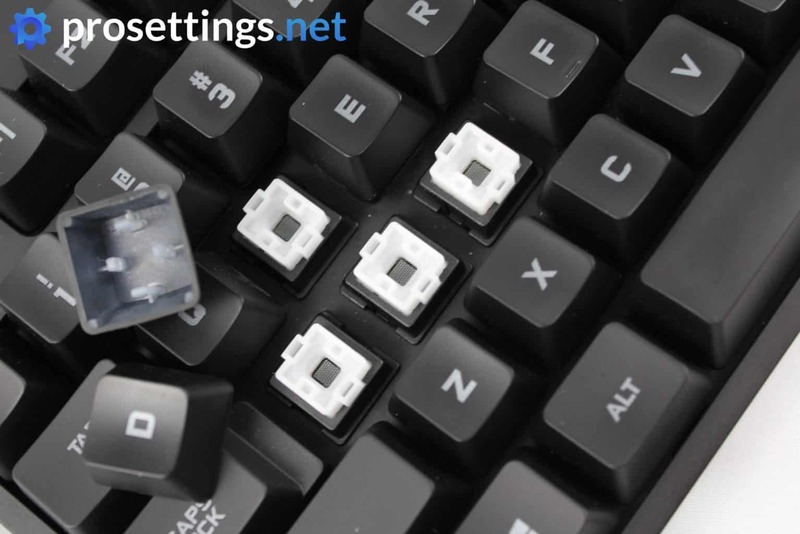 The G Pro Mechanical Keyboard was designed as a no frills product that’s made for one purpose: to help you frag out with minimal distractions. Logitech definitely succeeded on that front in my opinion. 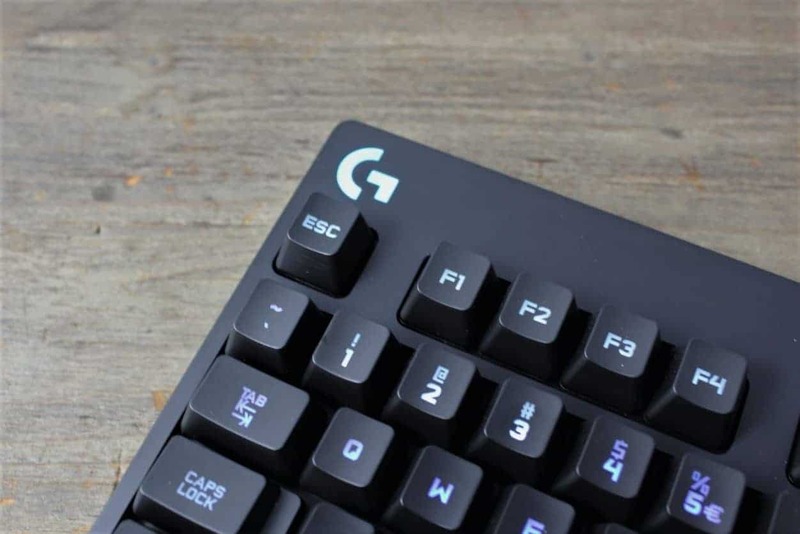 The G Pro is an easy to use gaming keyboard that’s very nicely built. That’s all there is to it, but sometimes simplicity really is key. 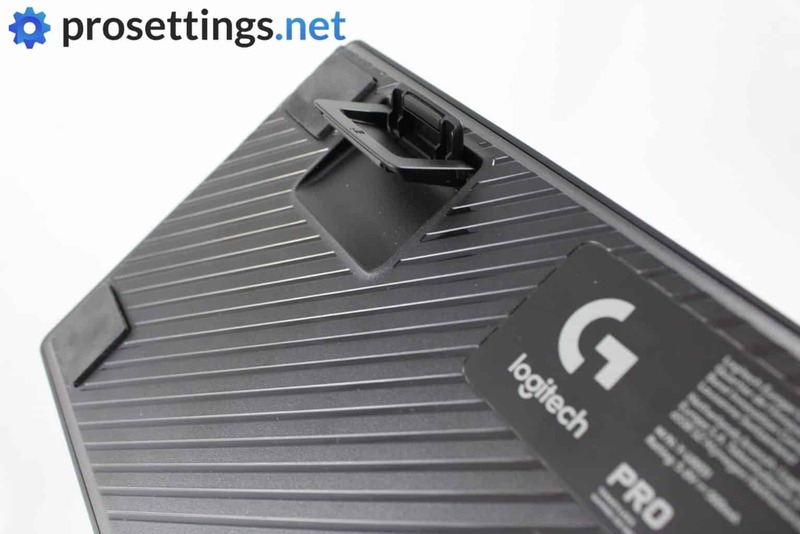 The G Pro Mechanical comes equipped with Logitech’s Romer-G Tactile Key Switches. Aside from having a lifespan of about 70 million keystrokes (according to Logitech, I obviously haven’t been able to put that to the test yet) they also have a shorter travel distance and actuate much faster than most other switches out there. This all results in a pretty unique feeling switch that’s actually kind of hard to compare to any of the ‘classic switches’ out there. If I absolutely had to compare the Romer-G Tactile I’d say it’s best compared to a CherryMX Brown, only a bit less tactile and more ‘membrane feeling’, but this is definitely a switch that you have to feel for yourself. Thanks to the design of these switches (they’re more of a boxy switch with the lighting element in the middle) all of the keys feel very stable and consistent, with the larger keys being on standard Cherry stabilizers that feel pretty nice out of the box. I realize that these switches aren’t going to be for everyone, doubly so because you can’t just swap the keycaps on this board thanks to the proprietary design of the Romer-G’s, but I actually quite like them. They sound and feel a bit mushy, for lack of a better term, so they certainly won’t be for everyone, but then again that is the case with any sort of switch out there. There’s a sound clip to the right, in case you’re interested. I always do a variety of typing tests whenever I’m testing a new board (certainly if it has a new/uncommon switch or design) to see how it performs, and I can say that my typing speed didn’t suffer at all. The keyboard also has 26-key rollover, which in practice means that you’ll never have to worry about ghosting or keys not registering, unless you have 26 fingers. As expected, the G Pro Mechanical performs admirably in game. I’m not a big fan of saying ‘this switch or that switch is the best for gaming,’ since that completely depends on personal preference, but the short travel distance and low actuation point definitely don’t hurt when you’re moving your character around with utter precision while avoiding a hail of bullets. 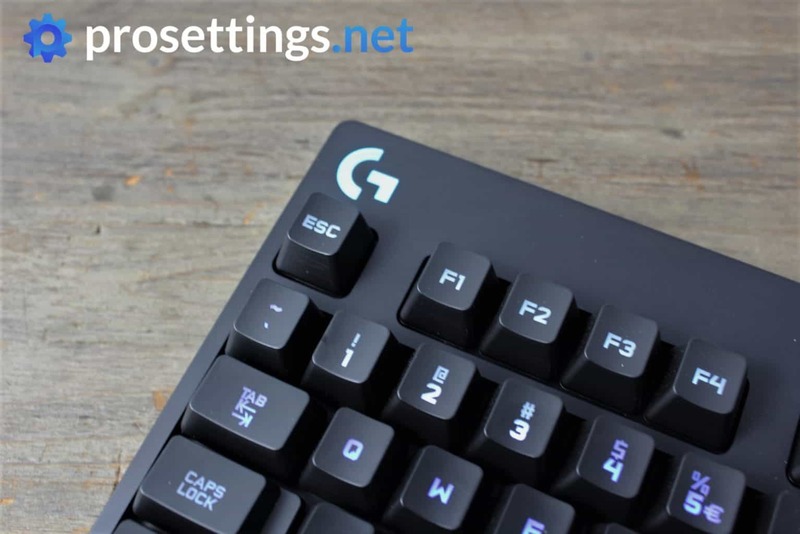 Logitech also mentions that the G Pro Mechanical has Keystroke Signal Processing (KSP), which makes it respond 10ms faster than ‘the competition.’ I have to admit that I didn’t scientifically test this, but I have to say that (so far) I’ve never tested a mechanical keyboard where I had an issue with a key registering too late. I guess it can’t hurt to have a keyboard be even faster than noticeable, but I wouldn’t go out and cop one of these based on the KSP factor alone. 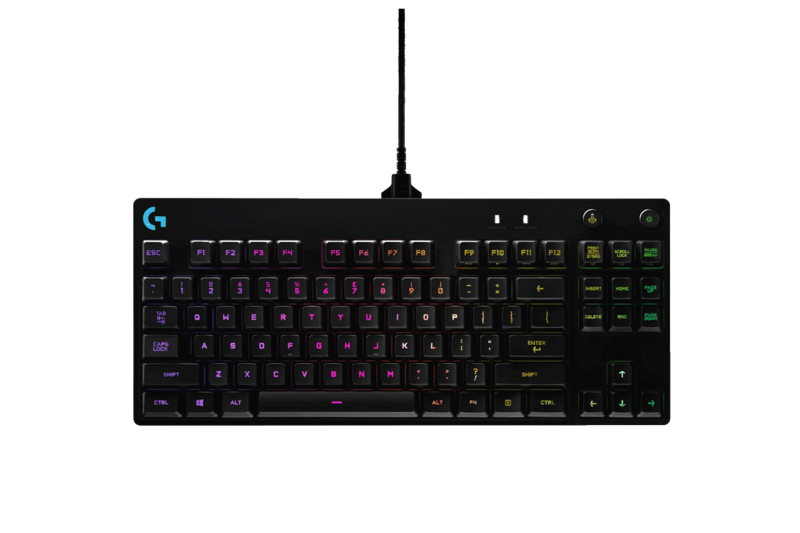 The Logitech G Pro Mechanical Keyboard doesn’t really do anything revolutionary, but what it does, it does well. 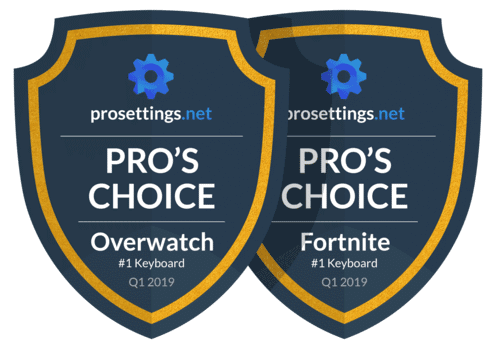 It’s a compact, sturdy, and well-performing no-nonsense keyboard that’s geared towards competitive gamers without offering gaudy or ultimately useless (for competitive FPS players at least) extra features. The switches are unlike any other mainstream switches out there, so I would advise you to try them out first if you have the chance, but if you’re looking for a reliable, straight shootin’ mechanical keyboard that won’t take up a lot of space and is easily portable then the G Pro Mechanical Keyboard should be on your radar. Nice review its a good board. I wish they could do a refresh for a 60% form factor and less bezels kn the top. Thanks! I rather like it too, but you do really have to be a fan of the switches I think. A 60% one would be great, but since their PRO line is made in collaboration with pros I assume they wanted a TKL version. Agreed on the bezels, would be nice if they could make them a bit smaller on the next iteration. Good review ! Can you review the g513 next ? Thanks! We’ll look into reviewing the G513, but as it’s not used that much in pro play it’s not really a priority as of now.